The VRX868RVD demonstrates maximum performance in the limited inner vehicle space. It delivers powerful video and sound despite its compact size. VRX868RVD provides a perfect nucleus for future extendibility and variety of use through HDD navigation, CeNET devices, iPod and 2-Zone capability, plus full compatibility with 5.1-channel surround sound. The VRX868RVD is the flagship model of the range. It truly represents the realisation of Clarion�s dream of creating a Multimedia Station, and excellent picture quality within the wide motorised monitor. 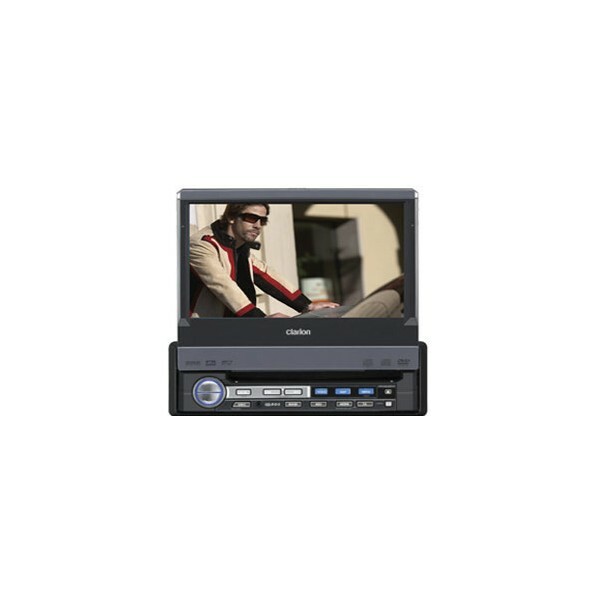 The system is combined with a multimedia player capable of playing a wide range of media such as DVD video and CD. All these functions are elegantly packed into a compact 1-DIN size unit. The individual system performance is outstanding, but when combined with iPod control through the touch panel and other fascinating media, this unit truly generates an almost unimaginable range of possibilities and future extendibility to provide drivers with the ultimate system configuration. The LCD panel uses the latest high-tech components and boasts an effective pixel rate of 99.99%. However, be aware that 0.01% or less of the pixels may be defective. just fitted mine, really pleased with it. good sound and a clear picture. Just fitted clarion screen from car audio and its really great, the sound is exceptional and the quality of the screen is like my pioneer plasma at home, I would reconmend this to anyone looking for the great car dvd player. https://www.caraudiocentre.co.uk/product_m-clarion-vrx868rvd_p-22796.htm 22796 VRX868RVD DVD / MP3 / WMA / CD player iPod direct connection https://www.caraudiocentre.co.uk/productimages/full/868.jpg 384.99 GBP Discontinued The VRX868RVD demonstrates maximum performance in the limited inner vehicle space. It delivers powerful video and sound despite its compact size. VRX868RVD provides a perfect nucleus for future extendibility and variety of use through HDD navigation, CeNET devices, iPod and 2-Zone capability, plus full compatibility with 5.1-channel surround sound. The VRX868RVD is the flagship model of the range. It truly represents the realisation of Clarion�s dream of creating a Multimedia Station, and excellent picture quality within the wide motorised monitor. The system is combined with a multimedia player capable of playing a wide range of media such as DVD video and CD. All these functions are elegantly packed into a compact 1-DIN size unit. The individual system performance is outstanding, but when combined with iPod control through the touch panel and other fascinating media, this unit truly generates an almost unimaginable range of possibilities and future extendibility to provide drivers with the ultimate system configuration.